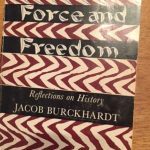 Jacob Burckhardt | Write Early, Write Often…Write Something! 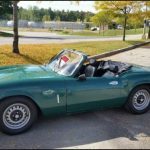 my 1972 Spitfire Mark IV was golden saffron–and threw a rod at just over the warranty mileage. didn’t go clear to his feet. 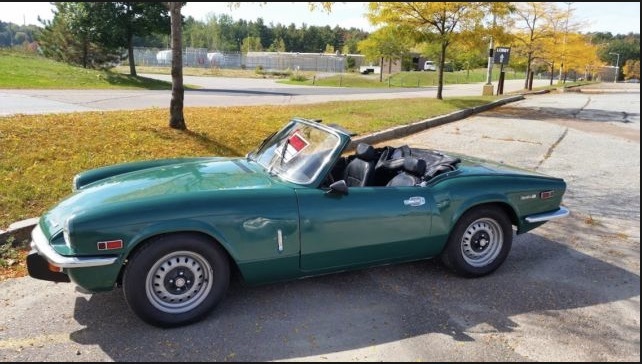 He was the whole reason I bought a Triumph Spitfire in the late 70s. But no, I did not have the intellectual rigor or the ambition toward high grades, I simply wanted to know history–all of it. When I was in college those were the only programs I was interested in, the history ones and anything ancillary to history, like urban geography–now that was a blast. But, I digress. One of the requirements of a BA in history at CalState Northridge was to participate in a seminar class and write a thesis. Because of reading so much history up to this point I was less interested in a particular period than I was in the idea of history, the theory of writing history, what it meant, not only to me, but to anyone else. How they used it. How it came to be identified. Was it truly the victor who wrote the history? I was stymied until my professor–who later hated my paper–recommended Jacob Christoph Burckhardt and I started doing some research. I remember my professor talking about the fact that Burckhardt was the one who named the period Renaissance. How cool! culturally and not politically conservative. 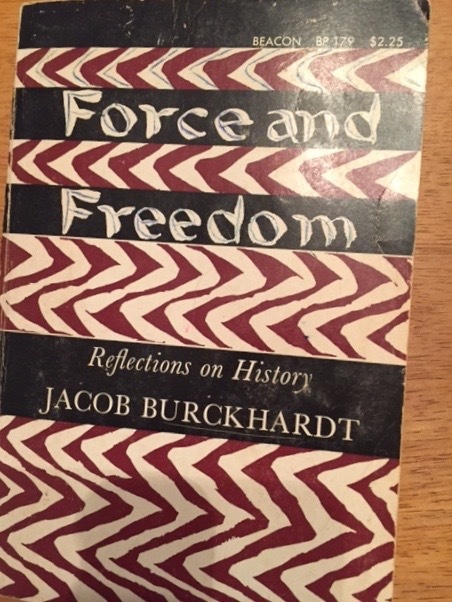 As I look back through FORCE AND FREEDOM , Reflections on History by Jacob Burckhardt, I see my notes and what it was that drew me into his writing. Though Protestant, his view of Roman Catholicism was that ‘Rome at least [able to] set other goals than those of power and comfort, steadily opposed the increasingly totalitarian claims of national states and maintained the intelligently realistic view of human nature which Burckhardt considered essential to political responsibility.’ He felt that liberals wanted people to think all things were possible and most people think possible means the material. Liberalism meant no sense of responsibility, no respect, no inner acceptance of the readiness to renounce for the good of the whole. He felt that democratic programs would eventually fall to ruthless military authority–that democracy eventually offered an over-developed state machine that would seize and exploit the state and thus the people, this was despotism built brick by brick, a paradigm exemplified by the straight line from the French Revolution to the Napoleonic Empire. Ah, history. How you look to repeat and repeat and repeat. Again, I digress. As I document my journey to, hopefully, publication of the narrative nonfiction I have optimistically entitled SACRED TRUST, The Congo from Leopold II to Dag Hammarskjöld I hope the best of it is in the nature of Burckhardt’s ‘sacred duty to preserve the memory of it’s greatest trials and triumphs. This entry was posted in Writing The Past and tagged conservative thought, history, Jacob Burckhardt, liberalism, Linda Sue Park, Roman Catholic on 2016/11/04 by teresafannin.